Why do we change the names of animals when they are prepared for consumption? To hide the fact you're eating them? You forgot to mention that some lucky animals, like the pig, have more than one name for consumption!!! I think that the actual name refers to the meat on the animal, thats why there can be many different names for when we eat them, as we are eating different parts of them. So we aren't actually changing the names of the animals, but being more specific at naming the part of the meat we are eating. 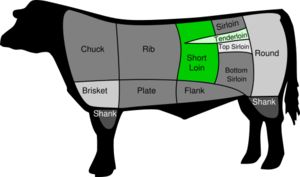 The names I left were categorical; beef would be the category where as shank, brisket and sirloin would be the sectional references or the ‘different parts’. The same can be applied to pork (pork is the only categorical name for pig, ham and bacon are sectional; the back legs and the underbelly. Once sufficient backlash upon my comments have been made, I shall divulge my opinions on why these names are so. Chicken is no exception, but the classification of the other meats is very thought provoking. Paul commented for me because I was too lazy, the classification of other meats isn't that important to me.